Ella Griffin was born and grew up in Dublin. A childhood dream of writing turned into an award-winning career in advertising - including a Barnardo's campaign that won the accolade of Ireland's BEST AD OF ALL TIME. Having turned freelance, Ella has written a wealth of travel pieces for magazines including IRISH TATLER, IMAGE, CARA and PRUDENCE, and has written a short film. I loved this book, couldn't put it down. 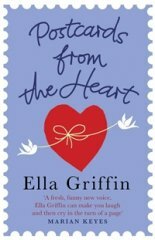 I've recommended Ella Griffin to so many friends, I'm dying for her next novel. She's an incredibly gifted writer. Really enjoyed this book. Made me laugh. Thankyou and well done to Ella! A really nice read and some good laughs to boot! Really well written - great pace and charm ! A really great read! I enjoyed this book so much! Such a great read, so well written, funny and witty to boot.